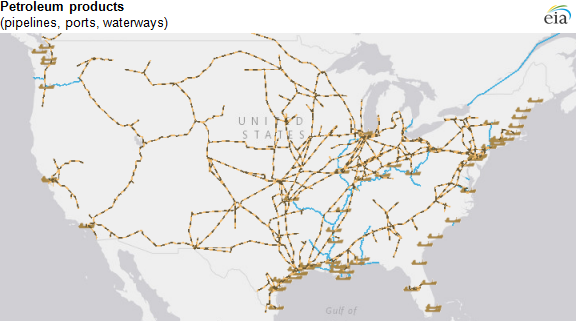 EIA's energy mapping system is a data-intensive visual reference tool that includes several map layers defining energy infrastructure components across the United States. 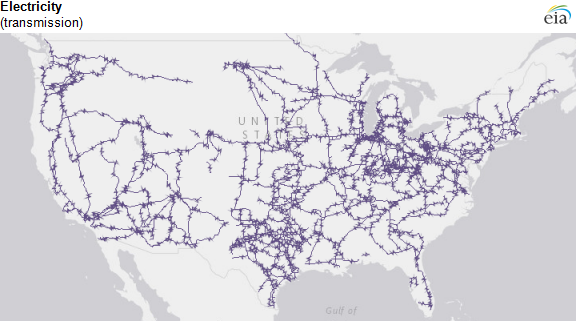 Using this series of maps, viewers can see crude oil, petroleum, natural gas, or hydrocarbon gas liquid pipelines, terminals, and ports in their area, as well as high voltage electric transmission lines. The mapping system combines information from many government agencies as well as public and private sources. Understanding infrastructure components is helpful as energy supply and consumption patterns change. 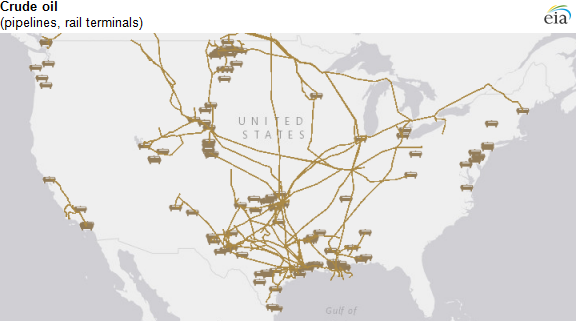 Crude oil pipelines and rail terminal locations are based on publicly available data. 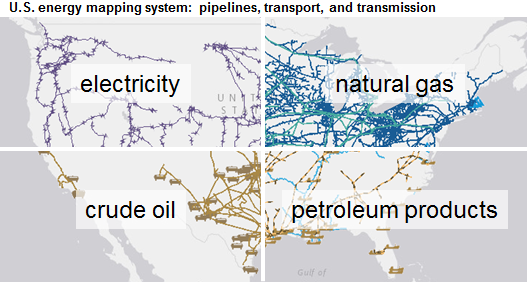 As with crude oil pipelines, petroleum products pipelines are based on publicly available data. Petroleum product ports and waterways (those capable of moving at least 750 short tons of products per year) are based on U.S. Army Corps of Engineers data, while terminal information comes from EIA's survey of petroleum product storage. Another map layer (not presented here) shows the hundreds of petroleum product terminals across the United States. 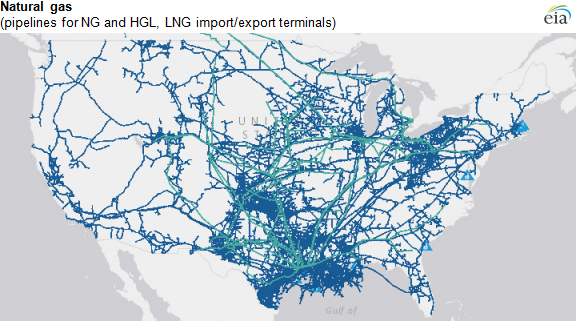 Information on natural gas pipelines is collected from the Federal Energy Regulatory Commission (FERC) and other external sources, while information on hydrocarbon gas liquid (HGL) pipelines is based on publicly available data. Liquefied natural gas (LNG) import and export terminals data are based on information from EIA and FERC. Electric transmission lines with voltages of 345 kilovolts (kV) or more are based on information from Ventyx. Because of copyright constraints, this map layer is not available when fully zoomed in. Natural gas underground storage facilities are based on EIA survey data. Although not presented in the example above, the mapping system also includes two petroleum reserves. The Northeast Petroleum Reserve, which includes reserves for heating oil and refined petroleum products, is based on EIA survey data and information from Northeast Reserves. The Strategic Petroleum Reserves are based on information from the Department of Energy's Office of Fossil Energy. These map layers can be presented over several base layers with geographic, topographic, street, or satellite image detail, as well as with state, county, and congressional district borders. 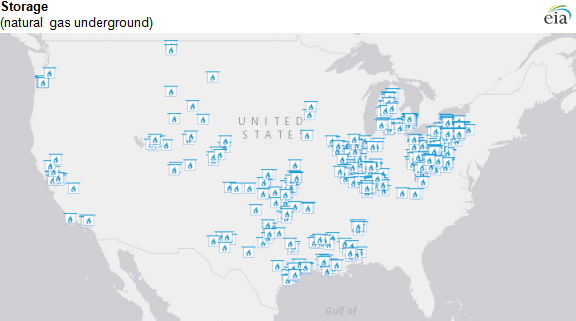 Each state's map is also included as part of EIA's State Energy Data System. 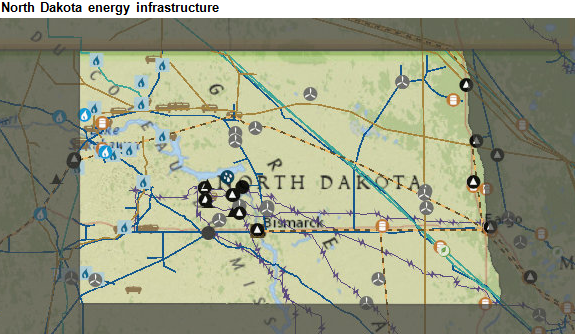 For instance, within North Dakota, viewers can see several components of energy infrastructure (pipelines, rail terminals, transmission lines) in addition to parts of the energy system, such as the locations of natural gas processing plants, coal mines, and wind power plants (including individual turbines).